We just barely started on a large quilt that Bonnie pieced. As usual, I am mesmerized by the different fabrics and find it hard to focus on my stitching. It is the only quilt we are working on now as we finished up the one from Alice’s grandmother (I suspect that Alice will be pleased as it looks so beautiful). But now time is tight as we have to have the large quilt finished by the middle of May. The more experienced quilters tell me that this won’t be a problem. Especially with the size of this quilt, we can easily have ten women quilting all at the same time. At least at this point. As we roll it in, there will be less space. There is a special sense when we are all gathered around the same quilt rather than divided between two frames. The conversations are more intimate. That’s not to say there isn’t a lot of laughter. We started talking about doing one of those girlie calendars to raise money for the Historical Village and soon were laughing so much that it was hard to sew. Or the jokes that result as so many of us don’t hear as well as we used to. Someone says something that is quite innocuous and it is heard as something entirely different by those on the other side of the frame. Soon the conversation gets so convoluted that one of the younger quilters needs to hush everyone up and explain the sequence of remarks. This week I brought up a concern I have about the high rate of teen pregnancy in our town. I suspect some of our young people don’t see a bright future for themselves or have goals that require them to make plans for college, or training programs or taking off to explore the world after they get out of high school. 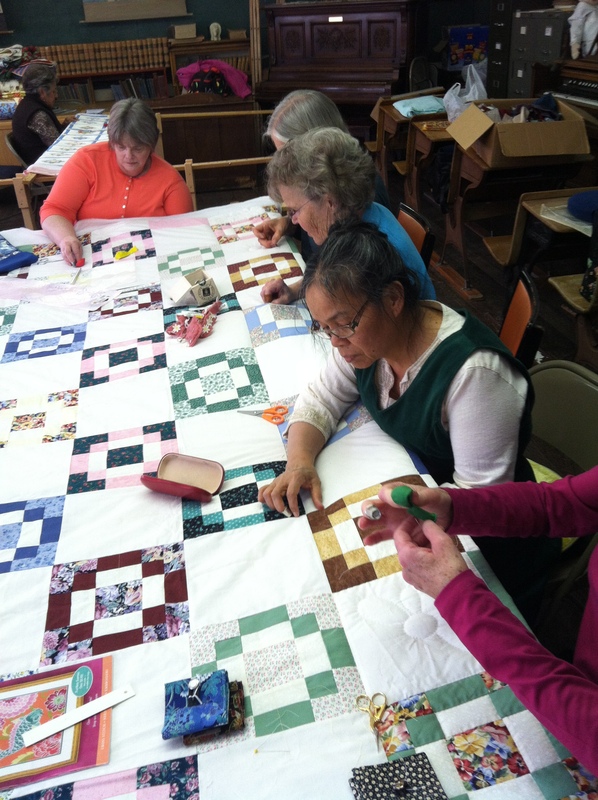 I asked the women quilting – what were you doing when you were 21 years one? And oh my!! Some amazing answers… Joan and her husband had just started the local newspaper. Bev was a nurse over in Great Falls. Judy was teaching to pay off her school loans. I left the east coast where I had grown up to start a life in California. I suspect if we invited high school students to sit and quilt with us, to be part of the conversation, they wouldn’t be enthralled. But who knows? Maybe they would glimpse a tempting world they didn’t realize existed.